A homeless unloved pup becomes one lucky dog in this tender picture book from the distinguished pair who produced Waiting for the Evening Star and the picture-book adaptation Lassie Come-Home. When a fortuitous bump in the road saves him from the dogcatcher's truck, a young West Highland white terrier is left to wander the streets looking for food and shelter. The dog receives only harsh replies when he barks at several doorsteps, and the darkness, rain and strange noises make his nighttime search all the more frightening. 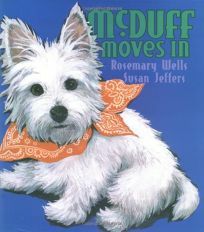 At ""number seven Elm Road,"" however, the pooch hits the jackpot, finding kindhearted Lucy and Fred, who adopt him and name him McDuff. Wells's short declarative sentences (""Rain poured down""; ""He needed something to eat"") convey a dramatic tension that is sure to grip young readers. The seamless pairing of deliberately ambiguous phrases (""But someone said, ""Hiss!"" from the woodpile"") with illuminating artwork (an angry cat perched on the woodpile) encourage the sort of lively guessing-game reading experience that toddlers and preschoolers love. Jeffers's cool-hued and creamy paintings sparkle, lit by intense moonlight, while McDuff, Lucy and Fred all radiate contentment and joy. Lucy and Fred's cozy home, period kitchen appliances and enormous automobile also suggest a 1940s-Americana setting. While dog lovers especially will enjoy this tail-wagging treat, kids in general will look forward to the further adventures of the plucky Westie. Ages 2-5. (Apr.) FYI: McDuff Comes Home ($12.95, -317-7) will be published simultaneously, and more McDuff books are planned.